TRUMAN, Harry S. President. Typewritten Letter Signed, one page, quarto, The White House, August 11, 1952. 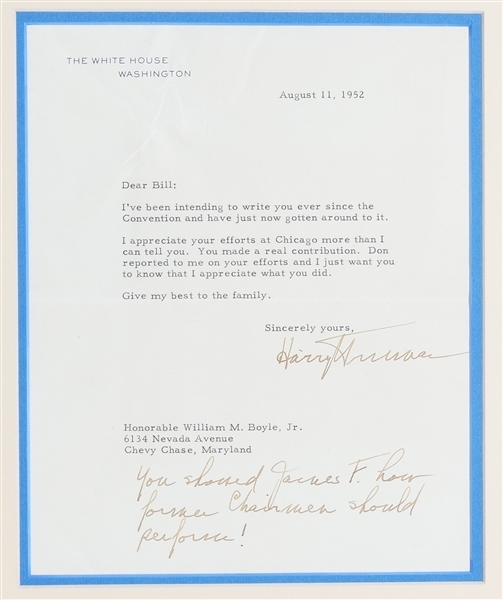 With original envelope and a handwritten postscript, to William Boyle, Jr. "I've been intending to write you ever since the Convention and have just now gotten around to it. I appreciate your efforts at Chicago more than I can tell you. You made a real contribution. Don reported to me on your efforts and I just want you to know that I appreciate what you did. Give my best to your family." The President then adds a postscript, "You showed James F. how former Chairmen should perform!" Fine condition. 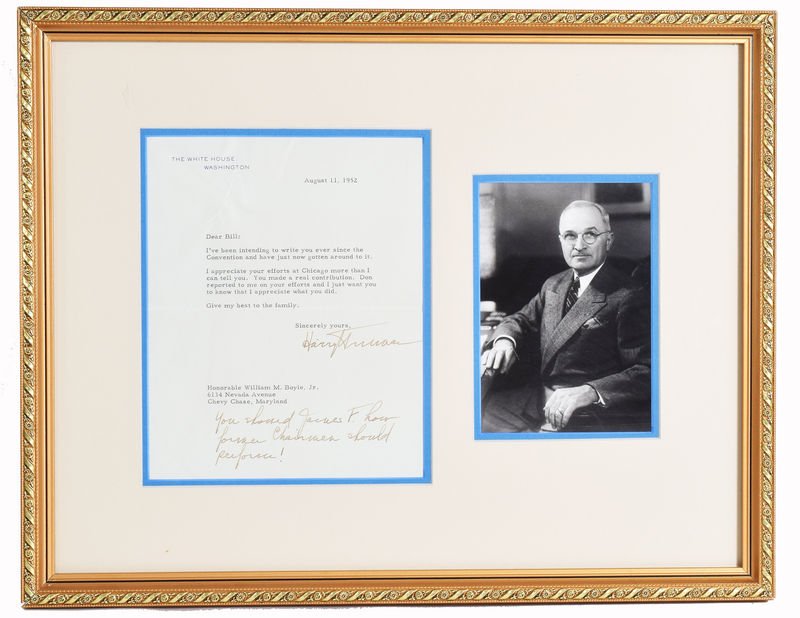 Framed in cream and French blue with a waist-length portrait photograph of Truman seated with his arm resting on his desk. Framed in decorative gilt measuring 18 inches wide by 14 inches high. William Marshall Boyle Jr. (February 2, 1902 – August 30, 1961) was a Democratic political activist from Kansas. Chairman of the Democratic National Committee from 1949 to 1951, he was a friend of President Harry S. Truman and is credited with engineering Truman's upset victory over Governor Thomas Dewey in the 1948 Presidential election.